Apollo Patios Victoria offers a range of outdoor home-lifestyle transformation services with the help of Local Designers & Installers that are backed by the strength of a National Brand. With over 8,000 projects & 25 years of experience, we are known for creating the perfect outdoor living area where your family and friends can build lasting memories. “Mike & Brenda” had wanted to upgrade their outdoor living area for quite a while, but were not sure where to start. After calling in the Apollo team for a Free Home Lifestyle Evaluation, they were amazed at all the creative options presented to them. This personalised patio not only looks great; it’s long lasting, low maintenance and has increased the value of their home. 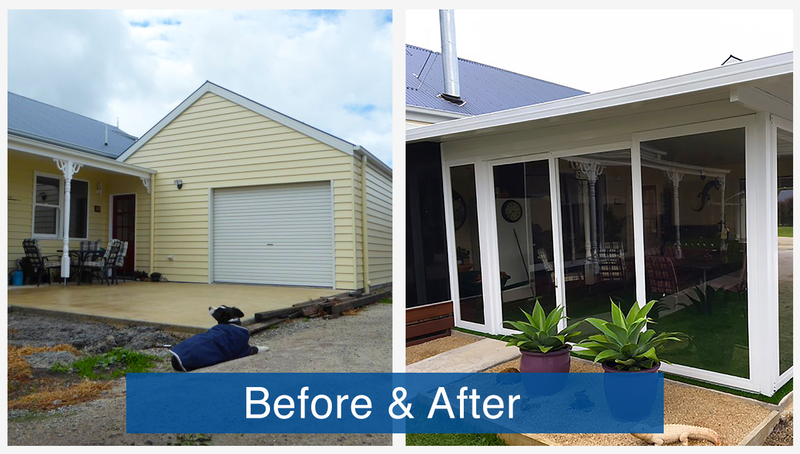 This home located on the Bellarine Peninsula was missing the finishing touch of a custom outdoor living area. The Apollo Patios team transformed their home by replacing the unused outdoor space with a brand new patio for the whole family to enjoy. Today, the owners can’t wait to friends and family over to enjoy their memorable out living area and patio. 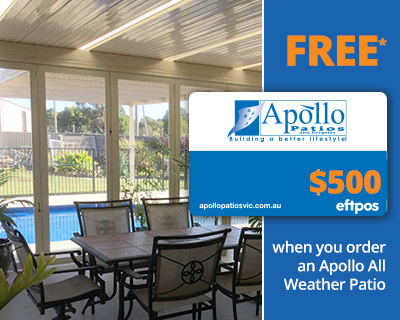 Displaying a full range of Apollo All Weather Screens, this stunning new patio, built in North East Victoria, is a perfect example of how Apollo Patios can convert a dull space into something you will be proud of. This outdoor entertaining area features a modern take on traditional architectural styling and design that blends with the character of the home. The patio not only provides outdoor living all year-round, but also adds real value to the home.